Prague artist Reon Argondian (nee Jan Zahradnik) was not simply content to show his pieces in galleries, so instead he turned his home into the Magic Cave, an old mill building that is now home to the Kingdom of Argondia. Among the forests covering Petrin, a small hill in Prague, Reon has established his psychedelic empire of art. A painter and sculptor, Reon (as he prefers) has covered every wall in the building with colorful hand-sculpted facades, making the interior of his house into an otherworldly cave system that he has dubbed, Argondia. Every surface has the rough natural look of stone accented by large, decorative roots, jutting out at irregular angles, and not an inch of the place is without swirling color making the experience of visiting the gallery not unlike stepping into a fairy tale world. On top of the full-fantasy conversion, Reon’s abode is also his art gallery. Hanging on every rocky wall are Reon’s trippy paintings and sculptures. Female figures explode off the canvasses in starry seas of color, while rocky columns display faux-Roman busts of sea unicorns, and load bearing beams have been carved into elaborate caryatids. 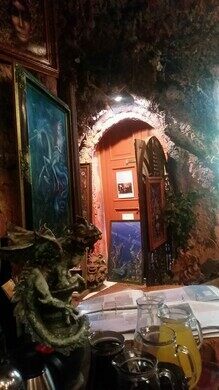 Reon claims that each piece in the Magic Cave was inspired by a personal vision and not some outside inspiration, but the experience of visiting his gallery may be the closest anyone has ever come to visiting the realms of fantasy. In order to find this Magic Cave you will have to wonder the forest and gardens of Petrin, the small hill just outside of the city.